Overloaded outlets and circuits can be dangerous to both your electronics and your living space. And let’s face it – it doesn’t look good either! Until we’re all living in a wireless world, we must find efficient (and safe!) ways to keep our electronics powered and charged. 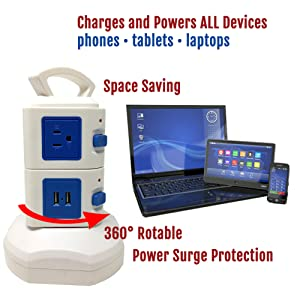 Our Vertical Outlet Tower does it all – charges AND powers all your devices with ease, and keeps wires out of the way. Wherever your devices are located, let the Vertical Outlet Tower work for you. It helps keep your wires off the floor or carpeting, and looks good doing it too. Internally, its power capability is second to none, with all-copper wiring making it #1 in its class in powering capability.